I recently spent 7 days rafting down the Colorado River with family, through all of Marble, and a good chunk of the Grand Canyon. We put in at Lee's Ferry (mile 0), about 17 miles below the Glen Canyon Dam, and took out at Whitmore Wash (mile 188). We ran rapids, got soaked and bruised, hiked up slot canyons to waterfalls, slept under the stars, and ate like kings. As one of our guides put it, you're on river time. That meant coffee at 5:15 am, breakfast at 5:45, and on the river by 7. 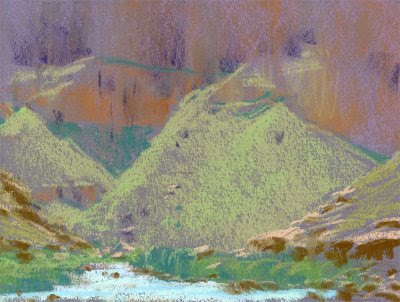 We'd have a stop for lunch, maybe another stop for a hike up a tributary or side canyon, and then pull in to a beach in the late afternoon for the night, waiting for the shadows to come across the water. 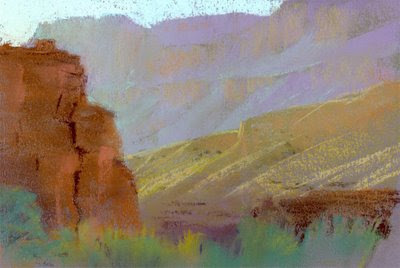 It was easily in the 95-100+ degree range every day, Hot winds would blow up the canyon, drying you out in minutes. The water of the Colorado is around 47 degrees, so you don't really want to swim in it, though getting soaked repeatedly is more than welcome. The tributaries, such as the Little Colorado, Havasu, and the many waterfalls we hiked to, were much warmer. If I had done no painting at all, it would still rank as one of the best journeys/vacations of my life. To share so much beauty and crazy adventure with family was a real treat. But this is more or less a blog about painting, so here is my deft segue into shoptalk. canson taped to one side. I would clip my paper to this when I worked. I stored my paper and finished paintings in a pad of tracing paper, cut down to the same size as my drawing board. 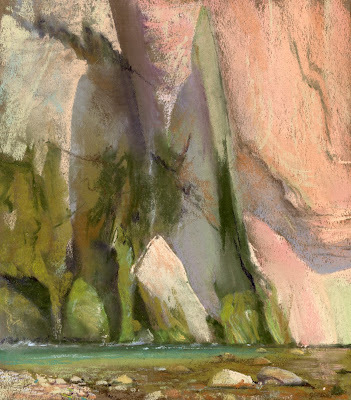 I've been having good results with Terry Ludwig Pastels, both at Pixar, and working outside, so I ordered a set of 'Southwest Canyon' colors, which contains 60 rectangular sticks. I probably used every color in it by the end of the trip. I did miss a range of some greens and less saturated violets, but overall, the colors provided worked well for more than 90% of what I was looking at. For a commercial set that is an excellent score. To allay fears of soaking all my supplies and paintings during the trip, I purchased my own dry bag from REI that would fit all my art supplies and paintings. This worked out great, as I could just clip it onto the central lashings on the raft, and not worry about it through the rapids, then easily grab it if we went off on a hike, or at the end of the day. One thing I would do differently would be to purchase a waterproof camera. I found myself in the ongoing dilemna of seeing something we would be drifting by, scrambling to get my camera out of my dry bag, taking the shot, then packing it up before the next rapid. I got so tired of this routine, that I moved to the ziplock baggie-in-my-shirt method, which worked fine until I forgot to put the camera in the bag through one of the rapids. Well, at least the memory card and battery survived. 2 other cameras on the boat met a similar fate, so I didn't feel too dumb. If you're going on a river trip, I highly recommend a waterproof camera for all the point and shoot stuff you encounter on the water. 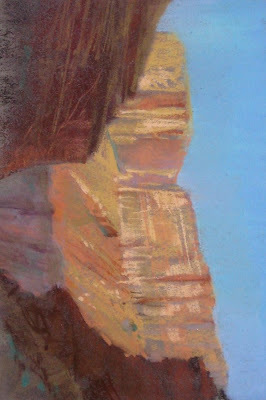 I painted in camp in the evenings, once in the morning, and on a few of the hikes, where there was enough time to work, getting 1-3 pieces done every day. 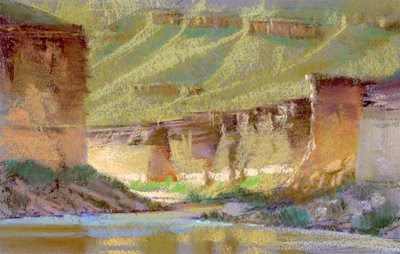 The range of local color and the intensity of reflected light into shadows was sort of a 15 on a 10 point scale. I simply wasn't prepared for the scope of it, and was constantly gawking and pointing out 'extreme' examples of this to my raftmates. Of course, I've been doing this for years, so I was tolerated. The confluence of the Little Colorado and the Colorado rivers marks the official beginning of the Grand Canyon, and the end of Marble Canyon. What is extraordinary and unique about the Little Colorado is its color. 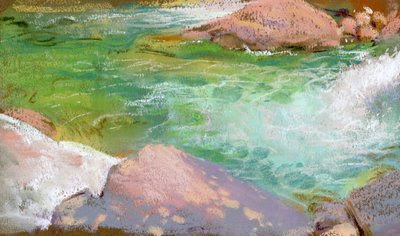 When the floodwaters end, the river's water supply is maintained by a travertine spring which deposits a white blanket of calcium carbonate on the bottom, turning the whole river into the color of a radiant turquoise swimming pool. Google "Little Colorado river" and see for yourself. I found some of my work to be indecipherable, or confusing, in absence of the context where it was painted, as illustrated in the 3 pieces above. It wasn't until the second or third day, that I started consciously working smaller, and simplifying shapes. 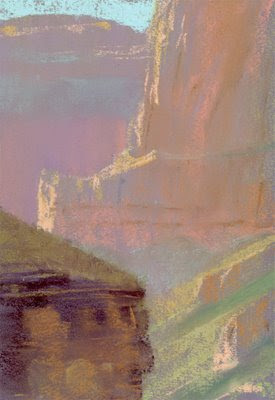 As the canyon grew deeper, stepping back and up, more atmosphere came into play, which was a welcome ally. I found myself looking towards the sun to get the break into the distance, as many of the views had no sky in them, just wall after wall of rock, and triangular talus slope. I came to appreciate some of the abstract qualities of what I was looking at, and felt that if I could anchor an image with something recognizable, like a cast shadow, or water, that it might just hold up outisde of the context in which it was created. Done at camp, the same evening as the shadows on the water posted above. A few miles below this point the river moves into the inner gorge, a narrow slot of Vishnu Schist, some of the oldest exposed rock on the planet, at over 2 billion years of age. Hard, glistening black, melted, twisted like taffy, and shot through with pink quartz 'snakes' of Zoroaster granite.The river moves fast, and there are a lot of rapids. No place to stop, no time to paint! in the shallows of the river, cooling our feet, and drinking beer. many pools and small waterfalls. I followed my usual pattern of swimming and jumping off of boulders to cool down, then finding a piece of shade to work in, while others hiked, rested, or swam. 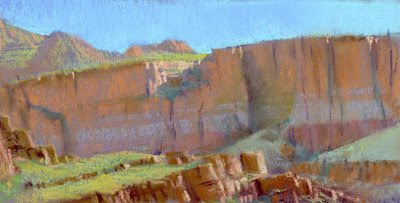 One could paint in this one canyon alone for a week. The color range in the water was fascinating to witness. This was above the takeout point at Whitmore wash. We were choppered out in groups of 6, and spent several hours at the Bar Ten Ranch on the North side of the river waiting for a plane to take us to Las Vegas. That is a runway in the middle ground of the image, and the South side of the canyon is visible in the distance. It's 3 more days of floating to get to Lake Mead. I would have been happy to keep going. 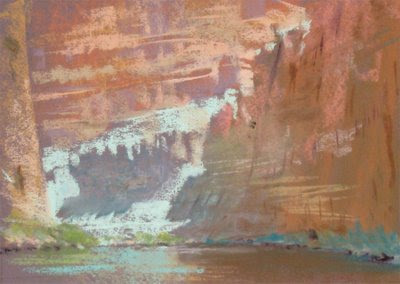 Anyone interested in an Artist's raft trip down the Grand Canyon, email me. 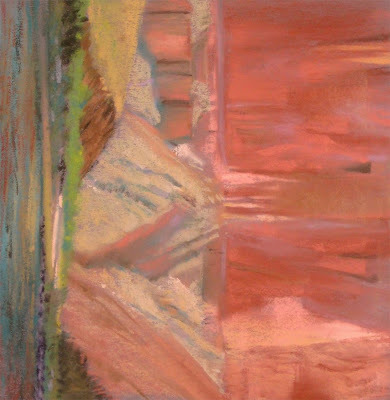 Even a 3 day float from where we took out to Lake Mead would be a great immersion into this extraordinary chasm of light and color. This is all theory right now, just looking at possibilities. I'm embarking tomorrow on a multiple family raft trip down the Colorado river for a week. We're in powered rafts, and will cover 188 miles of the river. Obviously we'll be on the water a lot. My goal is to try to do a morning and evening piece onshore each day. Since we're near the solstice, there should be plenty of light to paint on both ends of the day. I've made a downsized version of my pastel setup that will fit in a waterproof bag. I'll post the results when I get back. 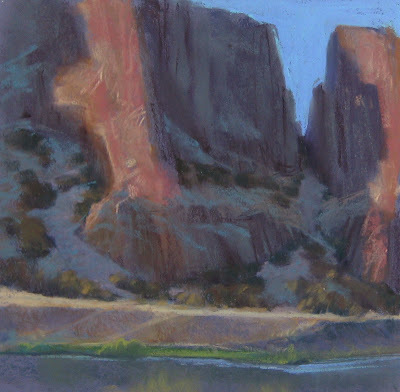 This piece was painted in 2006 on a stretch of the Missouri River, that runs through a small canyon before spilling out onto the great plains about 40 miles West of Great Falls, Montana. Mountain Palace is the name of a peninsula of cliffs that the river wraps around. While my brother-in-law fished in a drift boat all day. I took his truck and trailer and would drive down river, find a place to paint, and go to work. After an hour or so, he would come drifting into view. I'd pack up and drive further downstream and start another piece. This was the last one of the day, done right near the takeout point.